← Monday Question- How Do You Restrict Your Full Bottle Purchases? On May 1st it is traditional in France to give a small bouquet of lily of the valley. In Paris, you go to Guerlain and give your beloved a bottle of the yearly issued, strictly limited Muguet Eau de Toilette. The motto is “Un jour, un parfum!” and Muguet is only available for one day a year at the Maison Guerlain and Guerlain boutiques. That is a lovely and romantic tradition, and I benefitted from the generosity of a friend whose husband is the type to go to Guerlain and get his wife one of those yearly changing, but always beautiful bottles. Thank you for the sample, dear N! Atomizer bottle from 2009, original bottle from 1906, Quadrilobe bottle from 2007. 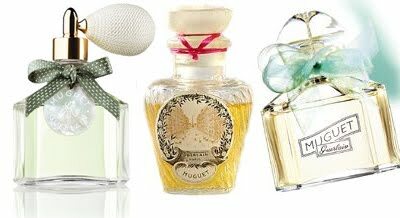 On Sorcery of Scent is a post about the changing bottle design, please hop on over to read all about that aspect of the perfume. Muguet was first created in 1905 by Jacques Guerlain and includes notes of bergamot, lily, lily of the valley, jasmine and rose. Muguet opens with bergamot and green notes, but almost immediately the fresh, a little bit soapy lily of the valley accord is here, sweet and strong. The jasmine is there to prop it up and it is the kind that teeters on the very edge of clean and indolic. The base is very Guerlain to my nose – the familiar vanilla, tonka amber combination gives the perfume a cosy and warm aspect that I find lacking in many lily of the valley perfumes, which I why they are not usually among my favorites. The almost gourmand base makes this little flower famed for its innocence and primness more grown up and down to earth. Muguet is less a perfume for angels, more one for people. I find the way Muguet is presented, both the bottle designs and the fact that it is available for that special occasion once a year only, very romantic and appealing, even though it makes it more difficult to obtain it. But isn’t the hunt a big part of our passion for perfume? This entry was posted in Floral, Fragrance Reviews, Green, Guerlain and tagged floral, Fragrance, Guerlain, Lili of the Valley, May Day, Muguet, Perfume, Review. Bookmark the permalink. There is definitely something very romantic about giving Muguet on May 01. The French just seem to get romance spot on. Thank you for the review of this, I had been curious to hear what it was like and it does sound rather lovely. Those bottles are just gorgeous aren’t they?! Jeez I know, they’re ridiculously overpriced! I’m no lily of the valley fan either but the almost gourmand, typicaly Guerlain base makes this sound a bit special. Which it is! Such a lovely tradition and gorgeous bottles too. For once I don’t mind the exclusivity. You are not helping to quell Undina’s lemming! They sell it in certain Guerlain boutiques worldwide as well, like NYC or Las Vegas. I would dearly love to try the Guerlain Muguet someday… I am such a keen muguet fan to begin with, and I love Guerlain’s tradition. I’m not sure that I’d actually read a review of the fragrance before and I must say your review has actually increased my desire to try the perfume! Well, maybe when I get the credit card paid off… LOL! If you are a lotv fan, it is surely worth a try, when you get the chance, it is very pretty. 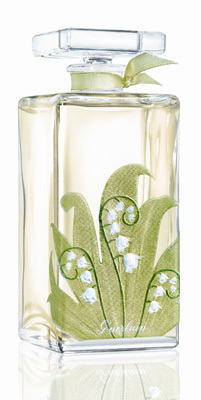 The Muguet bottles are really lovely, but now I’m curious- just how prohibitively expensive are they? Worse than say Amouage? I’ve been wondering as well about the L’arte et matiere line, are they just expensive or ridiculously so? Well, yes. This years bottle is around 300€ (I believe I saw the number 285€ somewhere) for 60ml (again not entirely sure about the size). L’Art et la Matiere bottles are 175€ for 75ml, which is not ridiculous in my opinion, but of course no bargain either. According to Robin at NST, the price is €385. Also, several commenters over there noted that the Las Vegas boutique still had the 2011 version for sale. So I guess that, at least in the US, it doesn’t sell out all that quickly. It’s good that they sell it as long as they have it, it would be a horrible waste otherwise. It does sound like a very lovely and romantic tradition, and the bottles certainly are gorgeous. 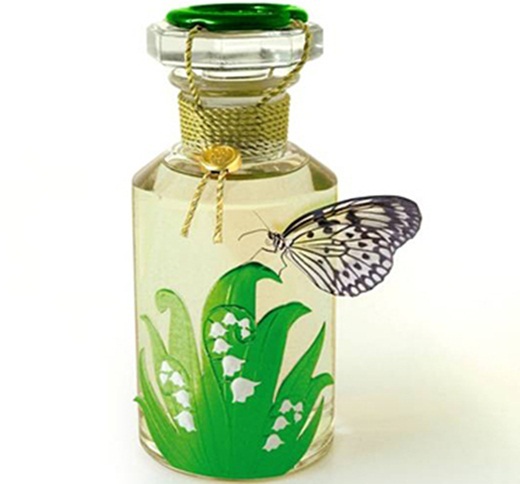 Not sure I would ever spring for a steeply priced lily-of-the-valley scent (I think I’d prefer a bottle of vintage Diorissimo if I was going to spend my money on that type of scent), though it was certainly fun to read about this. Happy May Day, Birgit! LotV are big today in Europe. I hope you find something lovely. BTW, I have heard that Malle is going to come out with a lotv fragrance soon, but that is not really a very affordable line. ooh neat! decant, here I come. Oh and btw, I DID know about the LoV references to May Day – Jen had a wonderful review about it all last year – but my aging brain cells forgot until today. D’oh! I’m totally with you on the aging brain cells issue, with me it is getting worse by the week… now what did I want to say again? I knew they did a new one every year, but didn’t know it was just available for 1 day! I guess they must only make a very very small amount to be sure they will sell out (which probably helps with that steep price tag!). Otherwise what would they do with the leftovers tomorrow? I am wearing my Diorissimo today for May Day. The 2012 edition is 1250 bottles worldwide. I’m not sure how strict that one day policy is enforced, I think they indeed sell out on May 1, but if not you can buy it later too until it runs out. I tried to comment last night, but the phone didn’t want to cooperate. In any case, I’d love to try one of the Guelain Muguets at some point, but it’s a shame that the “un jour, un parfum” concept isn’t a little more populist in terms of price range, given the nature of the holiday! Then again, I suppose populism isn’t really a good fit with the Guerlain mystique. Do they rework the formula every year, or does it maintain consistency over periods of time? Today I’m wearing Début by Parfums DelRae and later I may add a few drops of Tauer Carillon pour un Ange. Happy May Day, dear Birgit and readers! From what I have read the formula of Muguet remains pretty consistent throughout the years. Monsieur Guerlain wrote an interesting article about it some time ago. Oh dear, I completely missed that it’s May Day – I’m in the midst of working my way through the heliotrope note. Can I excuse myself due to the fact I have yet to meet a LOTV that likes my skin? Regarding heliotrope – did you try Carner Barcelona Tardes? A beauty! Carner’s Tardes had slipped below the radar, but I just put in an order for it – thanks for the rec, Birgit! I’ve also been looking for a sample of Reminiscence’s Do Re since you wrote about it, but the only place that offers samples is First in Fragrance, and there’s a hefty $15 shipping charge to Canada, so it may not make it to onto the list. I’m chuckling, because I was afraid you’d ask. I keep hoping it’ll show up, but no can do yet, I’m also hoping it’ll surface at some point. And I forgot to wear perfume altogether, being preoccupied by an apparently expiring computer! I wasn’t aware of this charming tradition, but I love the idea of the changing bottle designs, and a LOTV / MG(!) scent is always up my alley. A lotv scent from Guerlain would be especially up your alley then, I think.